Since the days of Mary Randolph, perhaps no one has done more to make “Maryland fried chicken” a familiar term than Albert Constantine, actually a native of nearby Wilmington, Del. After moving to Florida in 1959, Constantine, then 39, decided to become a restaurateur. With only “$2,500 and good credit,” he bought a place in the Orlando area, dubbed it Constantine’s, and served a traditional full menu. But first, he had to come up with a counter to the colonel’s meal ticket. Constantine had a “broaster,” a pressure-fryer for chicken, and he decided to put it to use. He experimented with thousands of combinations of ingredients; eventually he came up with a breading that he says incorporated 21 herbs and spices. 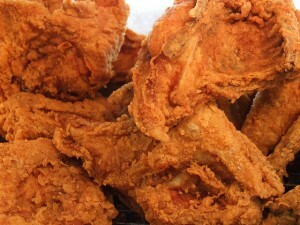 Then he pressure-fried the chicken in pure peanut oil. He went on to establish a chain of MFCs that earned him millions before he finally sold the franchise operation in 1975. Retired since then, he says he spends his time “dancing with pretty ladies” and traveling. Meanwhile, MFC eateries still thrive in a host of states, although not their namesake; the nearest outposts are in Bethlehem and Easton, Pa. But they still get most of their birds from Delmarva producers–and, Constantine says, still traffic in the nostalgic ideal of family farms and picnics in the sun.